An exhibition in Sydney is set to stir memories for the Aboriginal community. By Josie Gagliano. Photographer Juno Gemes’ exhibition is set to create awareness and stir conversation, and that’s exactly the effect she’s hoping for. The exhibition, Proof: Portraits from The Movement 1978-2003, opened at the National Portrait Gallery in Canberra in 2003 and now comes to the Museum of Sydney after a four-year national tour. The portraits, some of which are shown here, depict social and political moments in recent Australian history. One portrait shows Gough Whitlam, Aboriginal pastor Ossie Cruise, and activist Michael Anderson at a press conference at Sydney Airport in 1981. In another, tireless Aboriginal rights campaigner Shirley Smith, affectionately known as Mum Shirl, stands on the Town Hall steps after yet another meeting with politicians. For Gemes, the exhibition is a true labour of love. Born in Budapest in 1944, Gemes, who is married to poet Robert Adamson, was taught by master American photographers Lisette Model and Aaron Siskind. As a photographer keenly following the movement for Aboriginal rights over the last 30 years, she has created images whose underlying message is about respect for indigenous people. “When I began this body of work, one of the prime motivators was the power and culture of the Aboriginal people, and the way they were being treated by governments. To me, what became apparent was that Aboriginal culture was invisible. There was such oppression going on but most Australians knew nothing about it. “So I saw a need to communicate these images from one culture to another. Before I set up a shot, I'd ask the the ABoriginal people I was with, ‘What do we want to get across?’ And they’d say, ‘We want to show what the real situation is here.’ This would give me a guide as to what to do. The exhibition will be opened with a free public event from 2pm to 4pm at the Museum of Sydney on November 3, with Linda Burney MP in conversation with Gemes. The photographer hopes that people who attend will get “a sense of connectedness. I hope that they look at people represented in the photos and they look at the struggle that’s gone on for 30 years, and they realise that Aborigines are individuals, and that’s how we are to realte to them. “From a political aspect, I’d love people who see the exhibition to contribute in making a difference in reaching this sense of justice for the Aboriginal people. “Personally, I know that we cannot trust John Howard with changing [anything with] the referendum on the issue of reconciliaton. We need to get a real history of the suffering and the pain and the grandeur of the story. When we get that we can get a proper idea of what actually happened in history. We can’t allow Hward to hijack the debate. One of Gemes’ favourite subjects was activist Mum Shirl. “She remebered everybody she’d ever met. She was able to speak to Prime Ministers and police ministers, even when she was furious. Mum Shirl set up so many things for the Aboriginal community. In the same way, David Gulpilil is not only a genius dancer and a charismatic representative of his culture, what he wanted most was a respect for the culture. 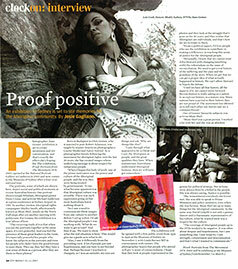 Proof: Portraits from The Movement 1978-2003 will be exhibiting at the Museum of Sydney from November 3 to March 2.